I'd love to have some artistic comment of that habbit of having plain, black (or tinted dark) tiles in the middle of areas. I've seen it used a lot, but I fail to grasp the rationale for it. 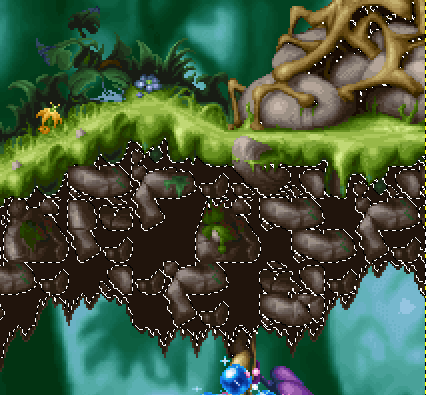 Of course, I get the purpose: avoid a repeated tile over the whole (non-playable) "wall" area, unlike what I did myself and can be seen in 16-bit games like e.g. Superfrog. or that some foreground element can be dark areas because of contrast-blindness like here. That works well in caves, and to some extent, we could simplify the 3D degression of lightning into a 2D tileset. But then, only when you have a large chunk of rock and a small corridor in it ... not for small platforms like those seen on the mock up. I am guilty of having done this myself despite finding the approach unappealing (I hope to remember to avoid it in the future). A lot of games simply just show the side of the tile, and if they fade to black it's to imply certain lighting conditions (like in Super Metroid where you see tiles fade into darkness often times in caves, but there are still many rooms that display the walls fully even in enclosed areas). I was thinking about this too recently. Basically, it's irrelevant visual information so it is cloaked in black, similar to how interior roofs are in rpgs with a 3/4 top down perspective. To justify it, I guess the idea is that the deeper into the cliff/dirt/soil you get, the darker it is, until it fades completely into black, but some transitions are more abrupt than others. I'm also curious about where the idea originated, can't think of anything off the top of my head. My preferred method would be to have a kind of strata system, with different layers of dirt/rocks/cliffs, where you can see bones and other misc. details down there, to make it visually interesting rather than stark in your face black. But of course, it is important not to get distracted with too many details in unplayable areas. I'm also curious about where the idea originated, can't think of anything off the top of my head. Besides when used appropriately, I think this is mostly an indie thing that dates back when people first started making games with stuff like Game Maker. 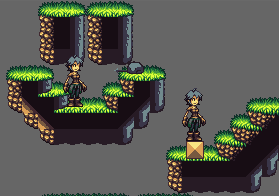 When I see this style I think "first time platform tiles" and not any certain game I might've played. It makes things simpler. You don't have to make complex transitions, variations, etc. I do that not only for dark surfaces but also for water (with plain blue in that case), I could of course give the water some structure but for that looking good I would need multiple animation frames per water tile as well as quite a lot tweaking... thats simply not worth it. So basically it decreases the work needed for a tileset without attracting much negative attention. Out of curiosity, what complex transitions do you mean? I have a hard time imagining it taking more tiles than you would use already. I was just referring to the generally decreased complexity there: a transition to black is easier than a transition between two structural elements. i like it for two main reasons. the first one is obvious—less stuff to make tile perfectly. the second one is more important—i'm a fan of not bothering with making the player worry about stuff that doesn't matter to the game. if an area is blocked out, then it's immediately obvious that it's not important—that it's impassable. a wall is a wall and there's no point in looking at it or thinking about it. I'd rather spend my time and effort (and the player's attention) on something that will have more of an impact on the gameplay itself—like animations. i do it because i started with RPGs—and interior RPG maps would have the "ceiling" areas blacked out. that's where i got it from. I mean for outdoor platformer tiles, which I feel this topic is about. Who's style is being imitated isnt as important as knowing what real life phenomenom is instinctively being referenced with the effect. Also, just because want to "black" things out to a certain color, doesnt mean this color has to be black . Blacking things out is imitation of a real life phenomenon of things disappearing in the dark, this phenomenom is even more true in photography, and it's called the "terminator" color, it's when things are so dark the camera cannot register differences in the lightness, so there's this terminator black killing all the subtle shades :p . In photography things also fade to white, when the subject is whiter than the lens can register it is said you are "burning" the picture, I'm sure you've all seen it when you try to photograph someone close to a light source, they seem to disappear into it. You can also make things fade into a mid-bright color if you think of it as mist, this is what happens with mist in real life and it's basically floating water particles so you could give it any hue, as water has the color of the light that hits it.